Non-demanding fans of the original The Matrix will likely be enthralled by the second installment in the series. More demanding aficionados will likely have a few reservations, some of which will not be addressed until the release of the third feature, Matrix Revolutions. I fall into the latter category. Although there are things about The Matrix Reloaded that I like, the movie is so open-ended and riddled with gaping holes that it's virtually impossible to view this as a finished project. Writing this review makes me feel like I'm putting pen to paper after seeing only half of a motion picture. At this time, I recommend the movie for what it is, but I reserve the right to revise that opinion in six months. It is possible perhaps even likely that the shadow of Matrix Revolutions will be so long that it will fundamentally impact the effectiveness of The Matrix Reloaded. The biggest problem with The Matrix Reloaded is that it is not a complete film. Moreso than other, recent multi-segment movie sagas (The Lord of the Rings, Back to the Future 2 & 3), this picture has a truncated, incomplete feel as if the ending is intended as nothing more than an intermission for a five-hour spectacle. That will be fine when the entire trilogy is available for viewing, but, in the summer of 2003, it represents an impediment to full enjoyment of what the Wachowski Brothers have offered. It has been four years since The Matrix reached screens, but, in the machine-dominated universe, only six months have elapsed. During that time, in large part due to the efforts of the messianic figure Neo (Keanu Reeves), the small human population inhabiting the hidden city of Zion has grown. The machines, taking notice of that growth, have decided to put an end to humanity. 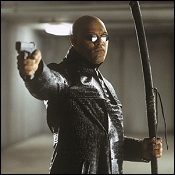 While the leaders of Zion prepare for war, Morpheus (Laurence Fishburne) takes Neo and Trinity (Carrie-Ann Moss) back into the Matrix to confer with the Oracle (the late Gloria Foster), hoping to learn how to fulfill the prophesy that will save mankind. While there, Neo encounters some new adversaries such as the deadly-but-suave Merovingian (Lambert Wilson) and his seductive wife, Persephone (Monica Bellucci) and an old one the indefatigable Agent Smith (Hugo Weaving), who is literally beside himself. The Matrix Reloaded delivers what a segment of the viewing audience expects visually dynamic action sequences separated by interludes of wordy, often pretentious exposition. The only real intellectual titillation comes at the end, when the storyline lurches forward in a moderately unexpected direction. One of the best things about The Matrix is that it was smart as well as visceral. While it's not fair to call The Matrix Reloaded dumb, it's not on the same level as its predecessor, at least as far as intelligence goes. The movie's characters often pontificate about choice, fate, and causality, but, once you delve beneath the sheath of cryptic language, you discover that they're not saying much that's new or interesting. There isn't much in the way of character development. The three protagonists are pretty much as we left them four years ago, although Neo has grown into his powers to the point where he's virtually indestructible within the Matrix. He's Superman in black, with no Kryptonite in sight. That limits the adrenaline level of his action sequences, since there's never any sense that he could lose a battle. When the fight involves Trinity and Morpheus, however, that's a different matter. 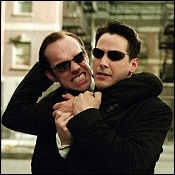 These two are decidedly vulnerable, and therefore represent Neo's Achilles heel. Keanu Reeves looks so good in Neo's gothic costume that it almost doesn't matter that he's not much of an actor. He's a great icon around which to design a bunch of special effects and he doesn't trip over his dialogue. (Not that he has much) On the other hand, if you're looking for a hero to bond with, Neo's not the best choice. Reeves' underplaying, whether calculated or not, distances him from the audience. On the other hand, both Moss and Fishburne hold their own, with the latter repeatedly commanding the camera's attention. 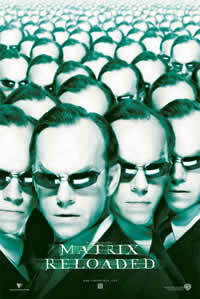 Hugo Weaving, taking a break from playing Elrond the Elf, brings his wonderfully dry wit to the part of Agent Smith. Lambert Wilson oozes false charm, and has the film's best one-liner (I won't repeat it here, but it has something to do with French cursing). Monica Bellucci is wasted, but she still looks great. Jada Pinkett Smith has a small role as Niobe, an ex-flame of Morphius' who now captains another ship. While some viewers will be disappointed with the movie's inability to constantly engage the intellect, few will be anything less than awed by its eye candy. If there's one area in which The Matrix Reloaded tops The Matrix, it's in the visual effects department (not a surprise, considering the budgets of the movies). This is a great looking motion picture. Darkness abounds, and the Wachowskis take full advantage of its atmospheric possibilities, with nearly every scene transpiring in locales where man-made lights fight a losing battle to hold back the shadows. There are some amazing shots in and around Zion (including an Engineering room more elaborate than anything in Scotty's wet dreams), and some Terminator-like views of the machines as they go to work. And the climax to the film's centerpiece action sequence a lengthy, convoluted car chase is breathtaking to behold. 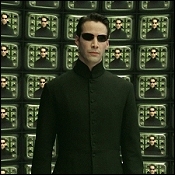 When The Matrix was released in 1999, it was not expected to be a big hit. Its stunning success surprised nearly everyone, including Warner Brothers. It cost about $60 million and grossed nearly three times that domestically. The video release widened its audience and increased its popularity. Production delays have meant a longer wait for the sequel than anyone intended, resulting in a Matrix feeding frenzy. As always when expectations are this high, there's bound to be a level of disappointment. Whether it becomes the highest-grossing R-rated film of all time or the biggest movie of the summer is of interest only to those who view box-office results like sports scores. On balance, The Matrix Reloaded does an admirable job of filling the niche it's supposed to that of an action-oriented science fiction adventure. Only time and Matrix Revolutions will determine if the material contained here is just a noisy, visually lively distraction or whether there are deeper currents we're not yet aware of.